KABUL: Chief Executive (CE) Dr. Abdullah Abdullah says millions of Afghan people wish peace and stability in their country and transferring peace messages through art was an affective step, a statement from the CE press office said yesterday. According to the statement, ‘Peace Caravan for Everyone’ performed a show on peace and stability in the country which the members of the Caravan was artists from Herat, Jawzjan and Daikundi provinces. 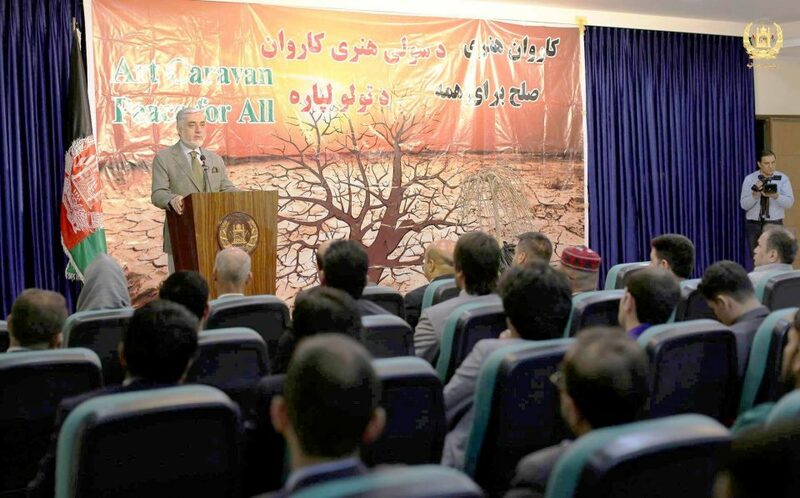 Delivering his remarks in a gathering of artists and culturists, Dr. Abdullah said Afghanistan’s problems were well-displayed via the show, calling show’s scenario and performance outstanding. Pointing to artists’ peace efforts through their works, Dr. Abdullah called their message as that of resistance and struggle which give hope of a bright future for Afghan people. The Chief Executive assured Herat theatre of addressing their issues, including reconstruction of Herat’s theatre building. The event was ended with distribution of appreciation letters to artists by Chief Executive, the statement concluded.